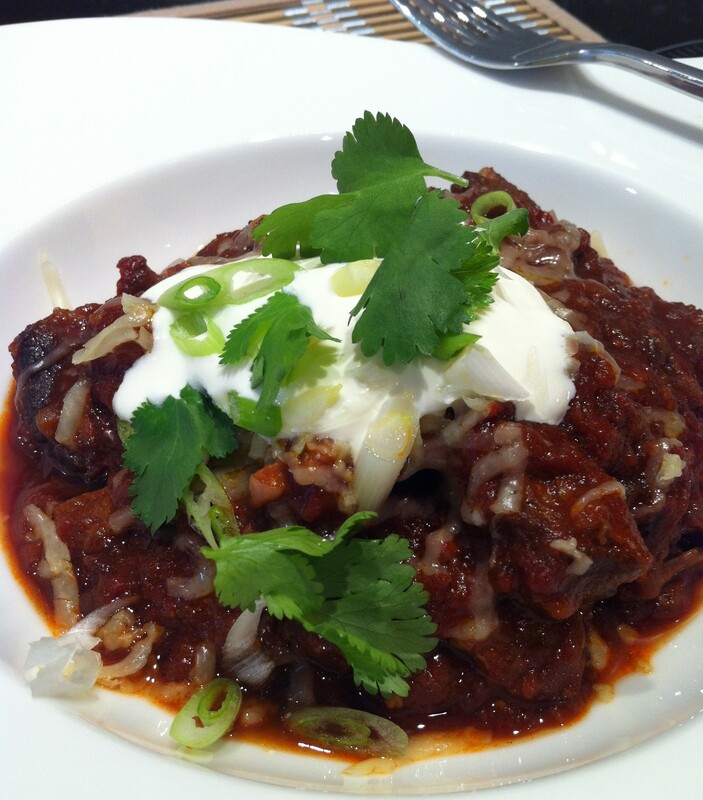 So without realising what was happening I found myself drawn to a recipe for a beef chilli in a recent edition of Donna Hay Magazine and before I knew it sticky meat was slow-braising in my oven.For those of you who haven’t come across Donna, she’s like Australia’s answer to Delia meets Nigella but with a lot more styling thrown in. The food design and graphics are stunning, albeit in an extremely contemporary way and I love finding the magazine in my post box thanks to a Christmas subscription given to me by my mate, Lou. However over the years I’ve found the recipes can be hit and miss and it’s best to follow them with a pinch of salt and a healthy portion of suspicion. I usually amend them a bit as I’ve produced some spectacular fails in the past when I’ve followed one of Donna’s recipes to the letter, in particular a pretty expensive mistake last summer; a deep tart with parmesan pastry and a filling of layered roasted portobello mushrooms, butternut squash and tallegio cheese immersed in an oozy, wobbly custard of cream, eggs and thyme. Sounds amazing, looked great, tasted spectacularly of nothing! It wasn’t completely inedible but I definitely chucked at least half of it which, quite frankly, for a tart is just ridiculous, it making the perfect snacking / lunch box leftovers. However on this occasion the dish was so simple that with the exception of cooking the beef in the oven rather than on the stove top I pretty much followed the instructions, and it turned out to be a great recipe. 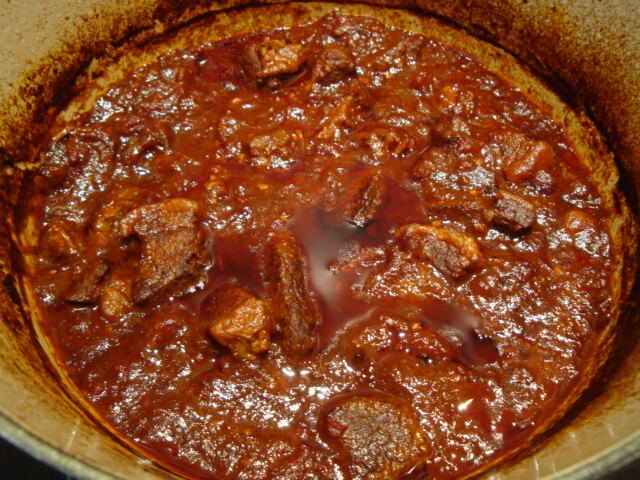 The smell during cooking is unbelievably tantalising, and especially torturous as I wasn’t intending to eat it that night; the smoke-dried chipotle chillies filling the kitchen with a heavenly sweet, toasty, mouth-watering scent whilst infusing the braise with luscious mellow heat. The following evening I finished it off with the original recipe’s addition of polenta and buttermilk dumplings to adorn the stew which were seasoned with chilli, cheddar and coriander and given 20 minutes to cook, plopped on top like sticky little golf balls til they turned golden. And that’s how we had it that night, but I could take or leave the dumplings so next time I might try it with some nutty brown rice or with a tin or two of kidney beans chucked in, but today I heated up the last remains and simply topped it with some grated cheddar, a spoonful of sour cream and a scant snipping of spring onion and coriander. And despite the weather becoming suddenly so autumnal the good thing is at least we’re at home much more (in particular me, as my new puppy Bo is quite a handful!) and have finally bought some brilliant kiln roasted logs which have given mega results in the pizza oven and will probably be used in the wood-burner sooner rather than later too, in fact I wouldn’t be surprised if we had to light the fire this weekend! We lit the pizza oven on Wednesday and got it to such a high temperature the poor lavender bush began to frazzle and we had to cut a clearing in the overgrown garden surrounding the clay hood and create a watery moat around it in order to go to bed and sleep soundly! 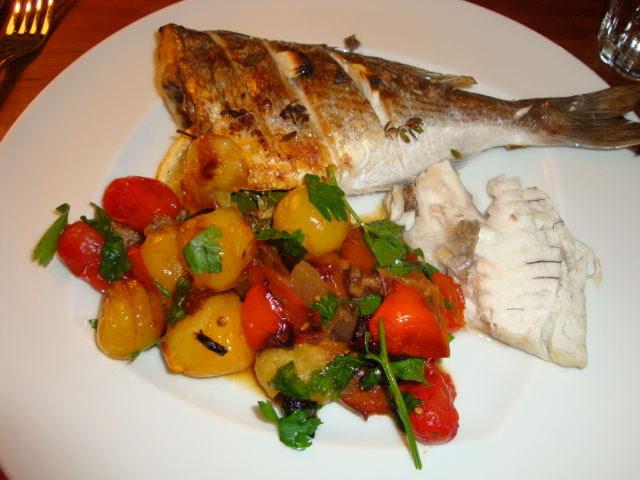 Instead of pizza though, we roasted some fresh bream from Oxford market with a few peppers and tomatoes. Lovely. 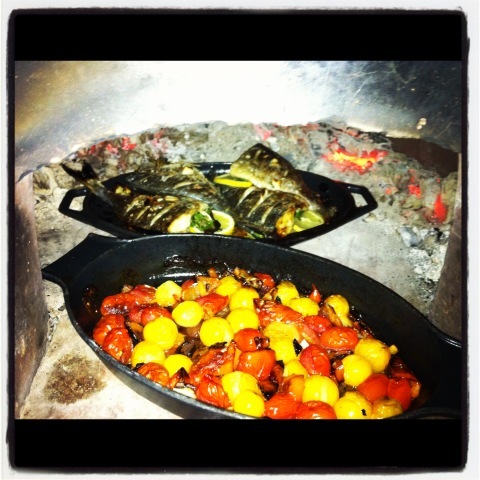 Fire roast bream and tomatoes. Lucky me! Just a modest little mid-week supper! I used a cheap brisket joint from the supermarket and just chopped it up. 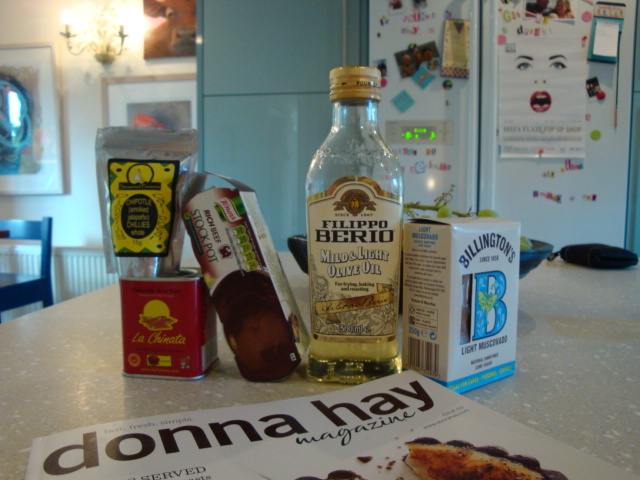 The rest of the ingredients are also cheap and simple, but get some good paprika, the kind that is in a small rectangular tin with a pretty picture on it. Nearly all delis have it or get it online at www.lachinata.com and make sure it’s the smoked sweet variety as, along with the chipotles, that’s what gives this dish its delectable sweet, smoky flavour. Turn on the oven to 150 c.
Heat 1 tbsp oil in a large casserole dish over a high heat. Season the beef with sea salt and pepper and cook, in batches, til browned all over and then set aside. Heat the remaining oil in the casserole and cook the onion and garlic together for 5 minutes. Add the paprika and chillies and cook for 1 minute. 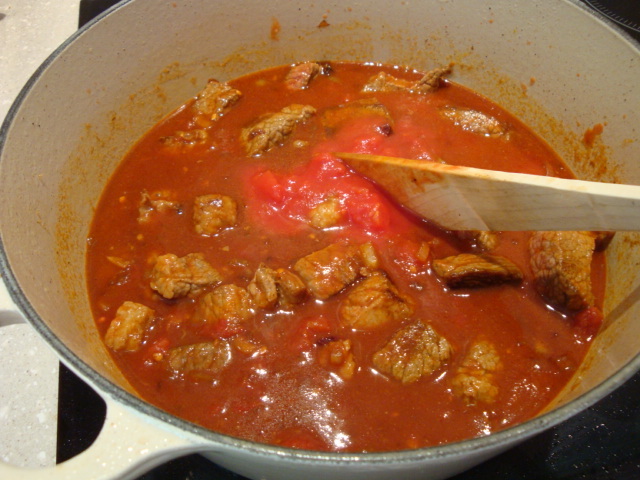 Return the beef to the dish and add the brown sugar, tomato puree, tinned tomatoes and stock, and bring to the boil. Cover with a tight-fitting lid and cook in the oven at no more than 150 o for 3 hours or so, or until tender. Check for seasoning but it shouldn’t need anything else. Now enjoy with your chosen embellishments and let the slow fiery warmth of the chipotles make you glow right down to your tootsies.